Hello, I am Derek Bender, and I am currently a Senior at The College of New Jersey. I am majoring in International Studies, with a minor in Russian Studies. 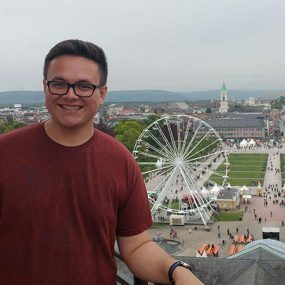 I spent my Spring 2017 semester abroad studying at the European Study Center in Heidelberg, Germany. While over there I fell in love with the culture, people, and lifestyle in Germany. My favorite aspect of studying abroad was becoming a normal citizen in a German city. I enjoyed walking around the city square, and becoming a local in several different shops. It allowed me to become immersed in my study abroad experience, and it is something that I believe everyone should be able to experience.